By the late 1970s the situation for vegans on opposite sides of the North Atlantic was very different. The 1975 IVU World Vegetarian Congress, held in Maine, USA, had been all plant-food, plus some small separate containers of milk and cheese for those that insisted on adding them. NAVS (North American Vegetarian Society) continued this as an annual event, but they soon dropped the optional additions and publicized it as ‘total-vegetarian’ – i.e. ‘vegan’, but that word was still very little known in the region. It was eventually renamed as the Summerfest that we know today, with the emphasis very much on health from plant-foods-only. In Europe, especially in the North West, there had been many strong ovo-lacto-vegetarian societies for more than a hundred years, and their events could be problematic for the vegans. Eggs and dairy were and integral part of the menu, and any vegan items were often poorly labelled. So in 1981, Kirsten Jungsberg, in Denmark, decided to organise a separate International Vegan Festival (IVF). The President of the British Vegan Society only heard about it two weeks beforehand, but went along and was delighted to find strong vegan groups from Sweden, and other countries, even France, among the 50 delegates. That might have started as a one-off, but in 1985 Kirsten arranged a 2nd IVF in Denmark, then there was a third in Germany in 1987. After that some of the European vegans began an informal network known as ‘Vegans International’ – there was no formal committee, just a contact for each country who tried to keep the others informed of anything of interest (this was all pre-internet of course). More IVFs followed - 1989 Sweden; 1990 Holland; 1992 England. By this last one the UK Vegan Society had finally caught up with the idea from the continent, and put on the biggest IVF so far, with 150 attending. The 7th IVF was in Spain 1993, organized by Francisco Martin, using the occasion to launch a new society, and coin some new words for his language:– ‘vegano / vegana / veganismo’, hence his Asociación Vegana Española. The Festival was acclaimed as a huge success, but Francisco came in for some criticism from the more ‘separatist’ vegans because he was also on the council of the International Vegetarian Union (IVU). Francisco had spent many years working in Canada, and preferred the NAVS style of veganizing from within, rather than screaming abuse from without. A few years later he was proved right, but things got worse in the meantime when the 1994 IVU Congress in the Netherlands became embroiled in yet more divisive arguments and food problems. In contrast the 8th IVF, held in San Diego in 1995, was another huge success, attracting more than 400 visitors for the week. 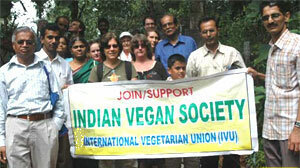 It was jointly supported by the American Vegan Society and VUNA – Vegetarian Union of North America (both members of IVU) - which was also completely vegan, just like almost all the ‘vegetarian’ groups in North America (though technically ‘total-vegetarian’ would be more accurate as veganism is an ethical lifestyle, not just a diet, and many American groups are not involved with animal ethics). The point was well made, and the IVU Council, with Francisco Martin now as General Secretary, soon informally agreed that all food at all future Congresses should be ‘entirely derived from plants’ (later formalized in the completely new IVU Constitution and Bylaws of October 1999). Meanwhile ‘Vegans International’ (VI) ran into its own internal conflicts and effectively ended in 1997. The IVF planned for that year never happened. The Australians tried to keep it going with a small IVF in 1999, but that was the last for many years. The former editor of the VI Newsletter went to the 2000 IVU Congress in Toronto, possibly expecting the worst, but wrote what can only described as an ecstatic report for The Vegan back in the UK: “This was really a World Vegan Congress.” He reported all the speakers promoting a plant-food-only diet, and making his own contribution on animal rights. Since then the requirement for food ‘entirely derived from plants’ has been extended to regional congresses and any other events supported by IVU. Meanwhile, back in Denmark, Kirsten decided to re-start the IVFs with the 10th in 2006. The Vegan reported an attendance of ‘about 50’, half from the UK and most of the rest from Denmark. But as the IVU Congresses were only held every two years, there was interest holding IVFs for the intervening years. In 2007, Shankar Narayan, IVU Coordinator for India & SW Asia, held the 11th IVF in India (Shankar 2nd right in the photo). Two years later Marly Winckler (with yellow star behind the banner), IVU Coordinator for Latin America, staged the 12th in Brazil. The latest was back to our old friend Francisco Martin, previously IVU General Secretary, who arranged the 13th in Spain in 2011. There was now some confusion around all this as we had alternate years of entirely plant-food ‘Vegetarian Congress’ and ‘Vegan Festival’, with no difference between the two, especially when the 39th ‘congress’, in Indonesia, added a huge food fair making it more of a festival, and the 13th ‘festival’ in Spain consisted almost entirely of lectures. In 2011 the IVU Council decided to resolve this by supporting an annual event ‘combining features of congresses and vegfests’. 2012 will be in California; 2013 in Malaysia; 2014 in Africa; 2015 in Latin America, and so on, rotating around the six regions – and all completely vegan of course. We now have a huge number and variety of ‘VegFests’ around the world, all vegan with some attracting visitors from other countries, IVU will be publicizing as many as we can.